The Boss CE-1 Chorus Ensemble dates back to 1976 — it was the very first Boss pedal to use charge-coupled delay line chips, also known as ‘bucket brigade’ or analogue delay lines, and it was reportedly inspired by the Roland Jazz Chorus amplifier released the previous year. 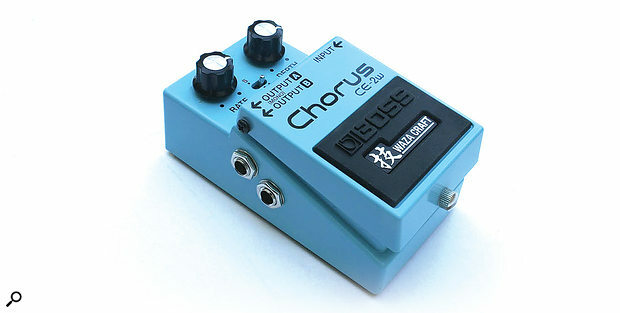 Three years after the launch of the CE-1 came the familiar blue CE-2 Chorus, which remained in the Boss catalogue until 1992, and Boss continued using the CE prefix for later models. 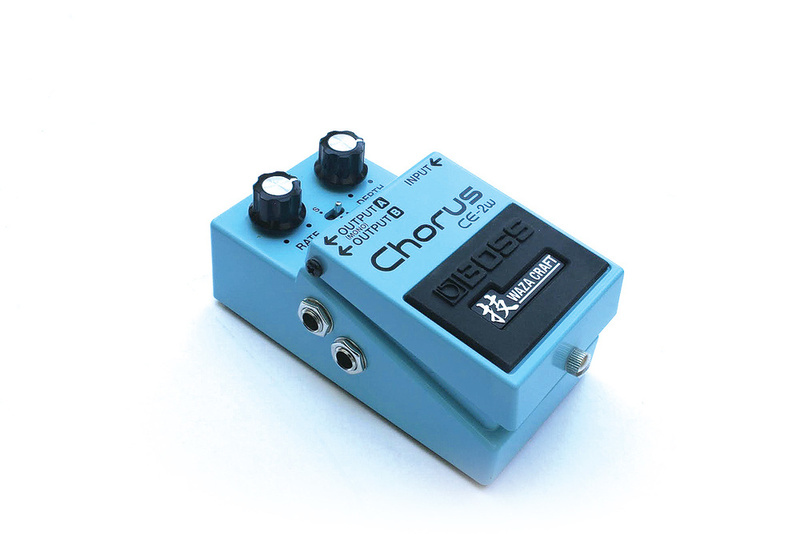 Now, on the 40th anniversary of the original CE-1, Boss have come up with the Waza Craft CE-2W, still in the familiar compact pedal format — and still blue. Waza Craft apparently translates as ‘art and technique,’ and implies meticulous design, attention to detail and being generally pretty damned good! Built in Japan, the CE-2W still uses analogue delay line chips (BBD) rather than digital modelling. The pedal, which has a buffered bypass feeding the same signal to both outputs when bypassed, offers a choice of three ‘stereo’ voicings. The CE-1 mode replicates the chorus and vibrato sounds of the original pedal as well as adding variable chorus depth. Aficionados will know that the CE-2 offered a more subtle modulation than the CE-1 and also has a subtle mid boost, but with the CE-2W, you get the best of both worlds as well as the ability to work in stereo — well, pseudo stereo, as I’ll explain in a moment. Both the rate and depth knobs work in all three pedal modes, which are selected via a small horizontal switch. The CE-1 mode occupies two of the three switch positions, one for chorus and one for vibrato. Sonically the pedal really nails the sound of the originals and manages to do so with very low noise. The adjustment afforded by the rate and depth knobs offers plenty of scope. The range of modulation effects goes from an extremely slow and gentle, almost phase-like chorus to a fast warble. Chorus can sound particularly impressive in stereo and, back in the day, I used to get a stereo chorus effect live by using two amps with a mono chorus patched into just one of them and the other running dry. The sense of movement this creates is uncanny — and that’s exactly how the effect is achieved here too. In all three modes, one output is effected and the other remains dry, but the subjective result is a very three-dimensional modulation. If you need the best of all chorus worlds in one pedal with the option to get a huge sound using two amps, then you need look no further than the CE-2W.